This month on the Dr. Nick Show, I talk at length about lifestyle drugs. Lifestyle drugs are devised to treat conditions that fall outside the medical realm of illness. Take male pattern baldness for instance – medical illness or life circumstance? Oh well, we have drugs to treat it either way. Should insurance companies (read: insurance premium holders/consumers/you and me) have to pay for it? Another way to define lifestyle drugs is: medicines that treat conditions caused by lifestyle choices. So, for instance, there are some groovy weight-loss drugs on the market right now. Cool. Should you rely on them solely? Hmmm. Or, should you pound the treadmill, pound the weights, and cut the calories? I mean, why should one do all that hard work when there’s this cool little pill? I dunno, why? Well if you listen to the latest episode of the Dr. Nick Show, you’ll get all the details on lifestyle drugs, and you’ll be able to make a decision on your own. And no matter what, you’ll see how these drugs are defining the direction our culture is moving with regard to pharmaceutical science. It’s no problem – it simply is what it is. However, just know that every substances comes with an added risk. And there just ain’t an easy answer – like a pill – that can fix all of our problems. The piper always gets paid in one way or another, ya know. Anyway, lifestyle drugs are here to stay. It’s big business. Check out these booming numbers – BusinessWeek calls them blockbusters (with sales of $1 billion or more a year). Drugs to help people wake and sleep as they please are particularly popular. And, of course, let’s not forget the drugs that help men have better erections. No, no Campos – that’s help men who can’t have erections. Uh, no…it’s not. 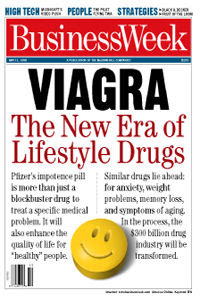 Lot’s of young, healthy guys are partying on Viagra – Viagra and methamphetamine, that is. Or ecstasy. Or coke. Swear. Check it out here. But don’t forget the risks gents. There’s always risks. For instance, the baldness drug propecia can cause birth defects if pregnant women inhale particles of broken pills (dosages are taken in half pills, so consumers must break them in half – brilliant, right?) or handle whole pills. And some cancer concerns exist with propecia too (scroll down to possible health concerns). So, like I said, the lifestyle drugs are here to stay. Risk aside, the market is far too lucrative for pharmaceutical companies to slow down development. No to worry, just know the risks and be careful. Avoiding lifestyle drugs, in my opinion is always best, but, if ya gotta do ‘em, then do ‘em intelligently – which is, for a very short period of time.